Manila—(PHStocks)—Philippine stocks extended their gains Tuesday, 21 May, on strong investor confidence amid continuing bullish outlook for the country. The benchmark Philippine Stock Exchange (PSE) index increased by 0.72% or 52.2 points to 7,327.58, retaking its foothold in the 7300 territory after a series of profit taking during the last three trading days. Most sectors are on the up. The Property segment surged by 1.94%, while the Holding Firms segment edged higher by 0.79%. 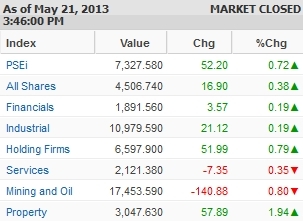 The Mining and Oil index, on the other hand, slid by 0.8%, and the Services sector declined by 0.35%. Trading was slightly heavy. Total value turnover reached PhP9.72 billion on almost 1.277 billion shares traded. There were 70 gainers against 100 losers, while 49 stocks were flat. 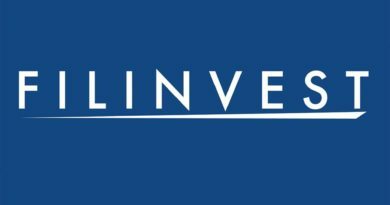 The top most active stocks for today are Ayala Land Inc. (ALI), Philippine Long Distance Telephone Company (PSE: TEL), GT Capital Holdings Inc. (GTCAP), SM Investments Corp. (SMIC, PSE: SM), Megaworld Corporation (PSE: MEG), Metropolitan Bank & Trust Company (Metrobank, PSE: MBT), Security Bank Corporation (PSE: SECB), Metro Pacific Investments Corporation (MPIC, PSE: MPI), Universal Robina Corp. (PSE: URC), and Ayala Corp. (PSE: AC).